Social Work Institute was established in 1987 under the auspices of the Nepal Jesuit Society by Br. James F. Gates, S.J. After Brother Gates’ departure in 1993, the institute’s responsibility was given to a team consisting of fully Nepali staff headed by a Jesuit President, Fr. William Robins, S.J. Since 2001 Social Work institute independently registered and formally separated from Nepal Jesuit Society. 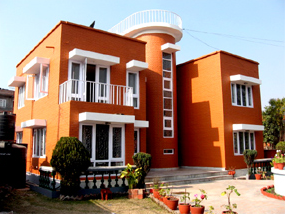 Social Work Institute (SWI) completed twenty-two years of service in Nepal in 2007. The institute went through many changes in its approaches and structure in its twenty years of existence. In the beginning the institute inclined more towards the charity and welfare model of social work focusing on the individual and family. The institute was involved in training people for drug rehabilitation programs, counseling and therapy for the troubled, child abuse and neglect, project oriented community development theories and income generation and skills development programmes. As the institute matured it began to realize that working with small groups was important but it was not sufficient if it was to contribute towards a positive transformation of the people in Nepal. Therefore, when the concept of Animation , a product of Paulo Freire’s approach was introduced in Nepal, the institute was one of the first organizations to accept this approach. It integrated the Animation and cooperative promotion concept in its curriculum and also in its approaches and methodologies. At present the institute leans more towards the national development of Nepal through human resource development through long and short-term training programmes and workshops. The institute also implements grassroots level community development projects mobilizing its alumni and partners with local organizations. However, it still maintains its original social work values, principles and its importance in working with people. The institute’s primary focus is in empowering people to become interdependent aspiring social and economical liberation, and to raise awareness against the repressive and oppressive elements of our society promoting social justice. The Social Work Institute envisions a just, socially conscious, inter – dependent and a free society. Capacity building Development of human resource Creation of people’s organization and mobilization of local resources. Focus on sustainable development Empowerment of Women, Children and the disadvantaged groups. Resource development, research and information sharing. Development and participation in forums for sustainable development cooperation. To provide para – professional training to develop committed and genuine social workers. To provide quality and professional training, workshops and seminars to development workers. To implement sustainable development programs through our alumni and Partner organizations. To empower Women, Children and the disadvantaged groups through programs and projects. To develop a resource development sector for research and information sharing and dissemination with our alumni and organizations working for the sustainable development of our people. The institute will visit organizations, institutions and schools to give lectures regarding development and social work in Nepal. It will also be available for lectures on requests.